﻿The Atlanta Center for Restorative Dentistry in Atlanta, Georgia, is a state-of-the-art treatment center. 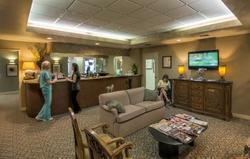 We promise to provide the finest dental care to our patients in a clean, inviting, and caring environment. Patients come to our practice for many reasons, ranging from routine maintenance and cosmetic restorations to major surgical or prosthetic reconstruction. At the Center, our entire staff is devoted to creating lasting beauty and providing comprehensive diagnoses, treatment planning and clinical care for adult patients. The Center focuses on re-establishing optimum health, function, and esthetics for our patients by carefully considering each individual's needs and desires in order to meet their expectations and achieve the greatest long-term prognosis. Patients will experience a sense of well-being as they are treated with dedication and expertise. At the Atlanta Center for Restorative Dentistry, we take gratification and pleasure in caring for and serving our patients-- creating a growing family of conscientious patients who seek value and excellence in their dental care. The Atlanta Center for Restorative Dentistry provides a level of clinical expertise advantageous not only to patients, but to fellow doctors as well with a referral base that assists regional doctors in the care of their most complex dental restorative cases. With a focus on comprehensive treatment planning and preventive education and care, the Atlanta Center for Restorative Dentistry strives to help each and every patient achieve the countless benefits of optimal dental health. Offering a complete range of treatments, our practice provides specialized dental care tailored to meet the unique needs of each patient.